I have been fortunate with my research into the Hoatsons to have been helped by several others, notably Claude Hoatson, who is a descendent of James Hoatson and Martha Robertson. Much of the information given on this page and on the tree below, has been kindly supplied by Claude and others who have helped me, for which I am very grateful. My 3 x great grandmother Jean (or Jane) Colthart married James Hoatson in 1848 in Crawfordjohn. Jane had previously had a child, my 2 x great grandmother Jane Saddler in 1844, but the couple went on to have at least 7 children of their own between 1849 and 1863. They remained in Crawfordjohn their whole lives, but lived in different houses within the parish. For much of it they lived at Gateside, but other times they were recorded at nearby Townhead. Both properties were a short distance outside the main village and were probably simple farm labourer's dwellings. The table below shows the entry from the 1861 census. Later in life they were recorded as being at Crossknowe or simply in "The Village". In 1881 James was absent from home, presumably away on work, he was either a roadman or a drainer. In 1891 James was home and the family were described as living in Crawfordjohn Village. Their home was said to have "3 rooms with one or more windows", which probably wasn't bad for a poor family in those days. The table below gives a transcription of the 1891 census entry for the family. Jane Hoatson Wife " 71 Roadman's Wife ","
Jane T Hoatson Daur Unmar 38 Housekeeper ","
James H Watson Grandson " 17 Unemployed ","
The James H Watson in the census above is a bit of a mystery. He is described as grandson and seems to be the James Hoatson Watson who was born 1873 (along with a twin George who did not survive) to a Marian Watson. For him to be a grandson of James Hoatson implies that his father was a son of James. But no father is named on the twins' birth certificates. 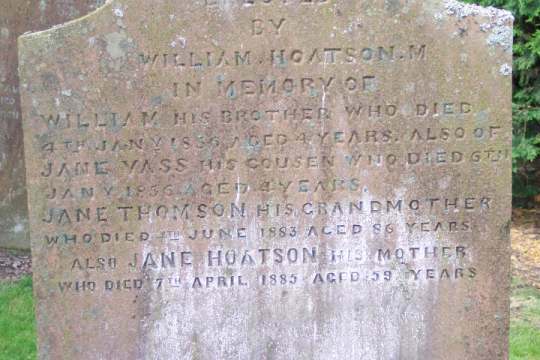 James Hoatson's oldest son William was 24 in 1873 and his brother John was 22. The mother Marian Watson was about 30, so a bit older than both of them, but they seem the most likely candidates to be the father. So for the time being it is a bit of a mystery; if anyone has any theories I would love to hear them. 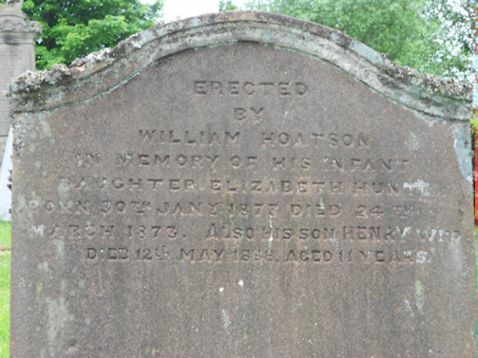 Jean Hoatson died on 21st August 1895 in Crawfordjohn village, her son William Hoatson was with her at her death. She was already a widow by that time, James having died in 1893. They are commemorated on the stone below in Crawfordjohn churchyard. James & Jean Hoatson were probably lucky for their time in that 6 out of their 7 children survived to adulthood and at least 5 of these had children of their own. Their second son John Hoatson married Margaret Renwick and moved to Lanark, then Culter before settling in Pettinain. 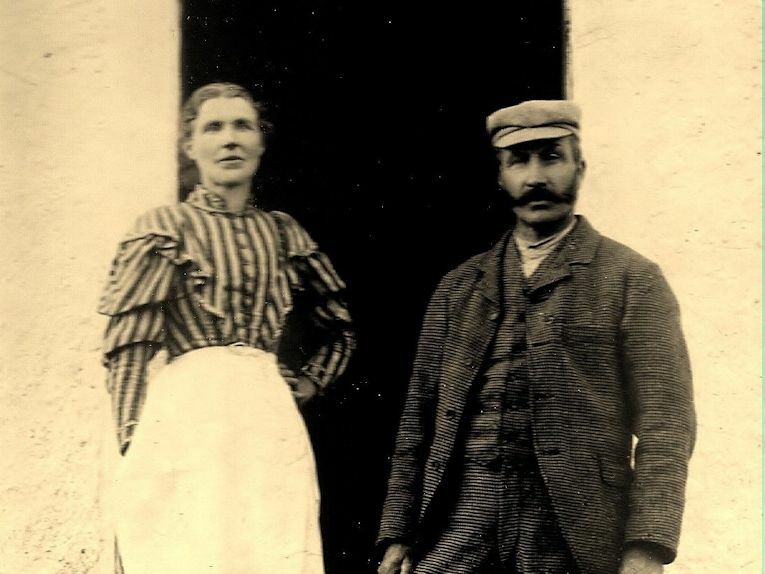 Recently I was lucky enough to be contacted by one of their descendants who let me have a copy of this great photo of John Hoatson and his wife Margaret Renwick. It would be lovely to hear from other Hoatson descendants out there and perhaps get a few more Hoatson photos. Jean Colthart's brother William also married a Hoatson - Mary, James Hoatson's sister. 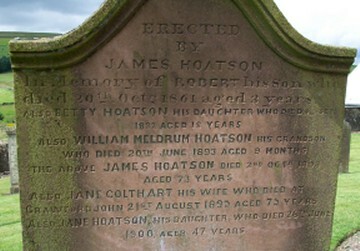 James & Mary Hoatson's parents were William Hoatson & Jane or Jean Thomson. I have yet to find a gravestone for William Hoatson, but Jean is buried in Crawfordjohn churchyard, along with several of her family. 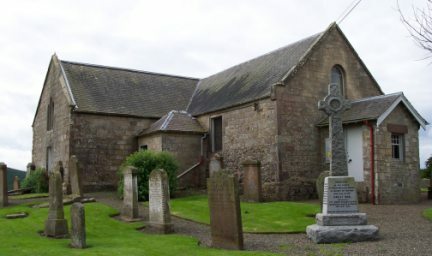 The photograph below to the left shows her stone while the one on the right is another Hoatson stone this time from nearby Douglas churchyard. Please click on one of the red links on the tree to move to a different page.